“The Scelsi Edition, Vol. 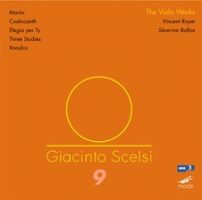 9: The Works for Viola.” Giacinto SCELSI: Manto (1957); Coelocanth (1955); Elegia per Ty (1958)*; Three Studies (1956); Xnoybis (1964). Vincent Royer (vla, voice), Séverine Ballon* (vlc). mode 231 (1 CD) (http://www.moderecords.com/). Royer is an inspired Scelsi performer. He plays as if improvising, easing into Scelsi’s languid microtones with grace notes flicked away like involuntary twitches. These pieces, perhaps coincidentally each comprising three movements, strive towards discovery as if about to burst into something larger, perhaps terrifying. Whether these are actually transcribed improvisations or memorials to specific moments, there is little else Eastern-sounding work for Western instruments. Manto slides eerily across the viola’s range, and Royer’s vocalization in the third movement documents the first time a male voice has recorded this triptych. Coelocanth and the Three Studies are more conventional, with fewer microtones and perhaps less scordatura, but containing a modest regimen of feverish outbursts. The Three Studies and this arrangement of the originally violin Xnoybis are first recordings. Cellist Ballon joins Royer in Elegia per Ty which Scelsi wrote in homage for his wife who had left him years earlier. Scelsi’s quivering intonation seems easier to deliver upon lower-ranged instruments and the duo relishes the pungent dissonance. The music ebbs and swells, washing detritus onshore. Xnoybis is possibly the latest, most mature work here (Scelsi’s pieces are often dated to their initial improvisatory sessions and not when they were written down irrespective of Scelsi’s later revisions). Compared to the violin version – which can sound like a thin piece of glass about to snap under its own weight – the viola’s slowly drifting unisons are breathy and lonesome. “Permutations.” Nikolai KAPUSTIN: Sonata for Viola and Piano, Op. 69 (1992). John McLaughlin WILLIAMS: Two pieces for solo viola (2011?). Ross Lee FINNEY: Sonata for Viola and Piano No. 2 (1953; rev. 1955). Jeffrey MUMFORD: Wending (2001). George WALKER: Sonata for Viola and Piano (1989). Eliesha Nelson (vla), James Howsmon (pno). Sono Luminus DSL-92186 (1 CD, 1 Blu-ray) (http://www.sonoluminus.com/). Nelson leads us confidently through varied and unfamiliar, predominantly American viola repertoire. Kapustin’s upbeat three-movement Sonata alternates seamlessly between casual jazz and postwar restlessness, perhaps a manic Poulenc. It does seem that Kapustin favors the piano over the viola. Williams’ two solo pieces neatly reflect Bach and Ysaÿe. The Finney Sonata, in the grand tradition of Brahms, or more relevantly, Shostakovich, proclaims lyric serialism. The disc’s title borrows Finney’s indication for the second movement Scherzo. Mumford’s Wending, whose title puns on its original dedicatee, Wendy Richman, courses determinedly using pitches derived from its first performer’s name. Walker’s comfortably atonal two-part Sonata offers vivid interaction between viola and piano. 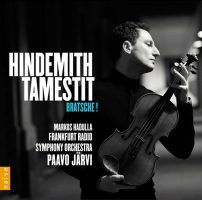 “Bratsche!” Paul HINDEMITH: Sonata for Viola and Piano, Op. 11, No. 4 (1919)1; Sonata for Solo Viola, Op. 25, No. 1 (1922)2; Der Schwanendreher (1935)3; Trauermusik (1936)4. Antoine Tamestit1,2,3,4 (vla), Markus Hadulla1 (pno), Frankfurt Radio Symphony Orchestra3,4, Paavo Järvi3,4 (cond.). Naïve V 5329 (1 CD) (http://www.naive.fr/). The viola was Hindemith’s own, possibly preferred instrument. The pieces are arranged chronologically, starting with a taut three-movement viola and piano sonata. The Finale takes greater duration than the preceding Fantasie and Theme and Variations. Tamestit continues his bold, vigorous playing in Op. 25, No. 1. This solo Sonata can be quite passionate, and when called for, frenetic. One movement has the marking quarter note equals 600 to 640 beats per minute. Der Schwanendreher (“The Swan Turner”) is a Concerto for Viola and Small Orchestra after Old Folksongs. Each movement elaborates upon a medieval German song. Hindemith was scheduled to give the London premiere of Der Schwanendreher, but King George V died just before the planned performance, and in a quick burst, Hindemith wrote Trauermusik for solo viola and strings which was premiered in its stead. Fitting its function, Trauermusik is hugely subdued, and as the latest piece here, perhaps most reflective of the thorny elusive harmony associated with Hindemith’s American works. Regardless, the violist ascends and Hindemith’s assured handling provides balance between soloist and strings. “György Ligeti: Sonate pour alto.” Heinz HOLLIGER: Trema (1981). 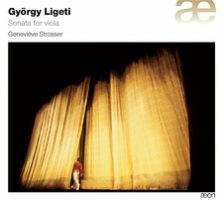 György LIGETI: Sonate pour alto (1991-94). Franco DONATONI: Ali (1977). Helmut LACHENMANN: Toccatina (1986). Giacinto SCELSI: Manto (1957). Geneviève Strosser (vla). Aeon AECD 1100 (1 CD) (https://www.outhere-music.com/). Trema is an eruptive quarter-hour fidgeting session, where all the notes sound like double-stops, and the violist never rests. The unease obscures an underlying slowly moving harmonic progression. In comparison, Ligeti’s easy embrace of a microtonal tune at his Sonata’s start (Hora lungâ) is calming, but no less insidious, for Ligeti easily moves towards agitation and complex rhythmic shenanigans in the subsequent Loop and later in the remaining even-numbered movements, the tiny Prestissimo con sordino and concluding Chaccone. Ligeti’s Sonata is the youngest piece here, which surprises as the multi-movement sonata appears to be the most conventional. Contrasts pervade Donatoni’s Ali. The first of two parts gradually mutates an aggressive short-long gesture into interlaced slow and fast material. The second movement establishes gestures missing from the first: harmonics, flautando, spicatto as contrasting material churns forth. Originally for violin, Lachenmann’s bow-screw tapping exercise has been transported to a bigger, louder target which might offer a slightly wider range. Scelsi’s three-panel Manto returns us to the more familiar bowed string sound despite the scordatura and the vocalizing in the third part. The sliding pitches and coarse tone are visceral, Strosser’s singing in the final part appropriately unearthly. 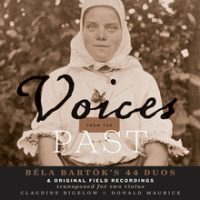 “Voices from the Past.” Belá BARTÓK: 44 Duos (1931; arr. Claudine BIGELOW and Donald MAURICE). Orig. field recordings. Claudine Bigelow, Donald Maurice (vla). Tantara TCD0213VFP (2 CDs) (http://www.tantararecords.com/). Several unique things are on display: Violists Bigelow and Maurice follow Bartók’s original violin duos transposed down a fifth as opposed to William Primrose’s more customary arrangement and reordering, and the first of two discs interleaves the duos with their corresponding field recordings. Not every duo has a precedent (mostly songs, a few instrumentals), but it’s supremely evident that Bigelow and Maurice have taken to heart the vocal inflections and texts. Bartók’s series is also pedagogic, the pieces grow more complex as Bartók unpacks his contrapuntal and rhythmic kit. Despite their brevity, it’s a moderate uphill climb to explore all 44 in sequence. 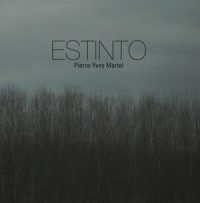 Pierre-Yves MARTEL: Estinto (2016). Pierre-Yves Martel (viola da gamba, harmonica). e-tron records ETRC025 (1 CD) (http://www.pymartel.com/estinto/). Who would have thought that viola da gamba and harmonica blend so well together! Martel’s hour-long Estinto firmly aligns him with late Cage and the Wandelweiser group, composers / performers of slower, silence-filled music. The combination sounds precisely like a shō which recalls Cage’s similarly paced One^9. Martel typically provides two closely spaced notes at once on harmonica and gamba, but ofttimes two notes on gamba and a third on harmonica, or two harmonica notes with a gamba tone. The experience can be to puzzle out what’s being sounded, or it can be simply to enjoy the weighted but calming tones and alternating embracing silences. “ContactoTango.” Gustavo BEYTELMANN: Cinco piezas para viola y piano (1997)1. Luis BORDA: El viento de verdad (1996; rev. 2012)2. Pablo AGUIRRE: Liberación (2010)3. Miguel VARVELLO: Entrelazados (2007)4. Astor PIAZZOLLA: Dos piezas breves para viola y piano (1949)5; Le Grand Tango (1982)6; Seis estudios tanguísticos (1987)7. Julia Rebekka Adler1,2,3,4,5,6,7 (vla), José Gallardo1,2,3,4,5,6 (pno). 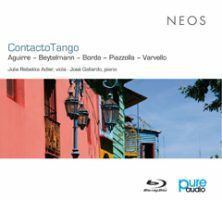 NEOS PABD 11319 (1 Blu-ray) (http://www.neos-music.com/). Adler and Gallardo demonstrate tango’s vast range. Adler has quite a flair for this repertoire, and Gallardo does not overwhelm. Piazzolla looms large, but the younger composers express their debt and expand the frontier. Beytelmann toured with Piazzolla in 1977, and his five pieces suggest a sonata, more jazz than tango. El viento de verdad, Liberación and Entrelazados are each moderately sized concert tunes: El viento soars high, Aguirre’s Liberación is a lively five minutes, and Varvello’s is gypsy-like, a Kreislerian tango. The program concludes with three examples of Piazzolla’s art. The two pieces from 1949 are curious for the absence of the acidity that infuses Nuevo Tango. Its curves and impulsive gestures are folkloric. Sensually alternating overt lyricism with gritty mechanics, mature Piazzolla is so distinctive: Le Grand Tango incorporates noise, glissandos, simple repetition and cellular motives. Le Grand Tango was written for Rostropovich and the Seis estudios were originally intended for solo flute or violin. The best is saved for last: It isn’t just that the viola is alone in the Seis estudios but that there’s intense painful, melancholy, as in the second study, Anxiuex et rubato.